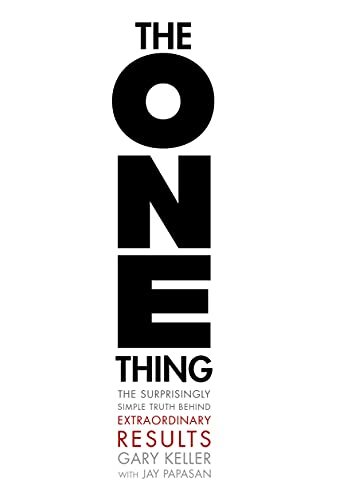 [PDF] The ONE Thing: The Surprisingly Simple Truth Behind Extraordinary Results | Free eBooks Download - EBOOKEE! Description: YOU WANT LESS. You want fewer distractions and less on your plate. The daily barrage of e-mails, texts, tweets, messages, and meetings distract you and stress you out. The simultaneous demands of work and family are taking a toll. And whatâ€™s the cost? Second-rate work, missed deadlines, smaller paychecks, fewer promotionsâ€”and lots of stress. AND YOU WANT MORE. You want more productivity from your work. More income for a better lifestyle. You want more satisfaction from life, and more time for yourself, your family, and your friends. NOW YOU CAN HAVE BOTHâ€”LESS AND MORE. In The ONE Thing, youâ€™ll learn to â€¢ cut through the clutter â€¢ achieve better results in less time â€¢ build momentum toward your goal â€¢ dial down the stress â€¢ overcome that overwhelmed feeling â€¢ revive your energy â€¢ stay on track â€¢ master what matters to you The ONE Thing delivers extraordinary results in every area of your lifeâ€”work, personal, family, and spiritual. WHATâ€™S YOUR ONE THING? No comments for "[PDF] The ONE Thing: The Surprisingly Simple Truth Behind Extraordinary Results".